1. Your little life still matters. In the midst of all this big political stuff, and in the face of evidence that certain peoples are suffering or will suffer more because of the current powers that be, still, believe that your little life still matters. Of course you don't want to go all insular right now. But some people stop tending their lives altogether at times like this! Others get sloppy in the tending, let go of countless kind details, forget to infuse their home and work space and inner world with love—and that omission won't support the good that can be directed outward. Hey, there were bad things happening before, and you were still willing to polish your boots. Until you die, whatever ebbs and flows around you, tend your beautiful life. When people express their greatest fears about the current regime, it's clear that these get pretty extreme: they go all the way to total annihilation of the human race and perhaps the earth. So (I know this is radical) what if you got okay with life on earth as impermanent—the human experiment and the earth experiment as time-limited from the start? Let's say somebody's going to be here when that grand ending occurs. What if it's you? What if you were willing to be in those numbers? What if death is so okay in the grand scheme of things that even the deaths of hordes of people at once can ultimately be okay in the eternal scheme of things? I hope you're not reading in anything I'm not saying. I'm not justifying genocide here. I'm not proposing you shouldn't care about the Earth or life on this planet. My intention is to help you let go of having to ward off death either for yourself or, ultimately, the whole human race or the planet, so you can get on with the business of living. In fact, you can live boldly and beautifully, truly voting for what you want with all that you think and speak and choose and do. If horrible things aren't what you vote for, then don't think and talk about them, picture them, rehearse them, discuss them, carry them around in your twisted gut or raw chest, and fall asleep envisioning them! Let go of what you can't control, get okay with your death (yeah, why not, every day) and go about the business of living an inspired life. 3. Please, don't use a president you disapprove of (or fear) as an excuse to revert back to old habits that you know are self-destructive, or go back to the ex you know isn't the right match, or hang out with friends who bring you down, or make any number of wacky, self-sabotaging choices as if personal insanity were a reasonable response to the unreasonable (and perhaps insane) in politics. No no no no no. At the risk of repeating myself, keep living like it matters (and sure, dance like no one's watching, while you're at it). Are you having one more glass of wine than usual? Try one less, and maybe one more bubble bath. 4. Use this time to keep learning more deeply and consistently that you can (and are better off when you do) focus on where you actually have agency. Take responsibility for your life, your state, what you cultivate internally that you then put out to others, and what you do for the greater good in smaller or larger arenas, from your household to the world. I know I sometimes harp on Byron Katie's three kinds of business (quit yawning) and I did include a whole chapter about them in my book (chapter 7, Getting Out of Overwhelm, still in the free download of part one, which I'm so happy people have been taking me up on)—but that's because it's seriously liberating (no, seriously, LIBERATING) to get very clear about where you do and don't have agency and to put your energies where you do and only where you do. Aaaaaaaaall your efforts aimed at what you can't control (including worrying, agonizing, talking about how we're all screwed, etc) can only exhaust and overwhelm you, and will not likely lead you to right action or a good life. They won't set you up to offer your best support to those in need, either. There's a reason the famous Serenity Prayer is all about locating what you have the power to change and letting go of what you do not. 5. Use this political climate to keep learning more deeply and consistently that you get to control your own focus and your own state. A president you don't like doesn't have the power to keep you from joy, clarity, kindness, alignment, or anything else—unless you turn that power over to him (I use the gender-specific him here for obvious current reasons). If you consume a steady diet of bad news; if you join in or eavesdrop upon spoken or written conversations centered around fear and focused on what we're against; if you fail to draw internal mental boundaries that can keep out what isn't here when it's not here—then you yourself (not the current politicians in charge) are responsible for your misery and eventual ineffectualness in supporting, promoting, creating the climate you want. If you're conversant in Abraham-Hicks (or willing to check it out) and wish to hear a truly brilliant and kind take on the current political state of affairs, here's a 30-ish-minute audio clip that I think is worth your time at least 5 times over (and I recommend listening more than once if you like it the first time). While this talk (or Abraham's language through Esther Hicks, the channel) (I know) may seem hopelessly New Agey, the ideas presented here offer more in the realm of hope and hopeful perspectives than anything else I've encountered. I invite you to ignore the Abraham language that sounds odd to you and simply open to the greater ideas that support you to get okay with what is so that you can carry on putting your best foot forward. Abraham gives an eternal perspective that reminds you there's plenty for you to do, as long as you're here, no matter what the political powers that be are up to. That has always been true. Also, if the current state of affairs provides a contrast that helps you step more firmly into all you wish to create, Abraham suggests that's a very good thing. I so appreciate feedback! I'd also love any questions or your thoughts about what else you'd like me to address in the realm of dealing with political pain. Just hit reply if you're receiving this as a mailing or write me at jaya@jayathetrustcoach.com. More support: Get 11 Rules for When You're Discouraged or Distressed off my home page. 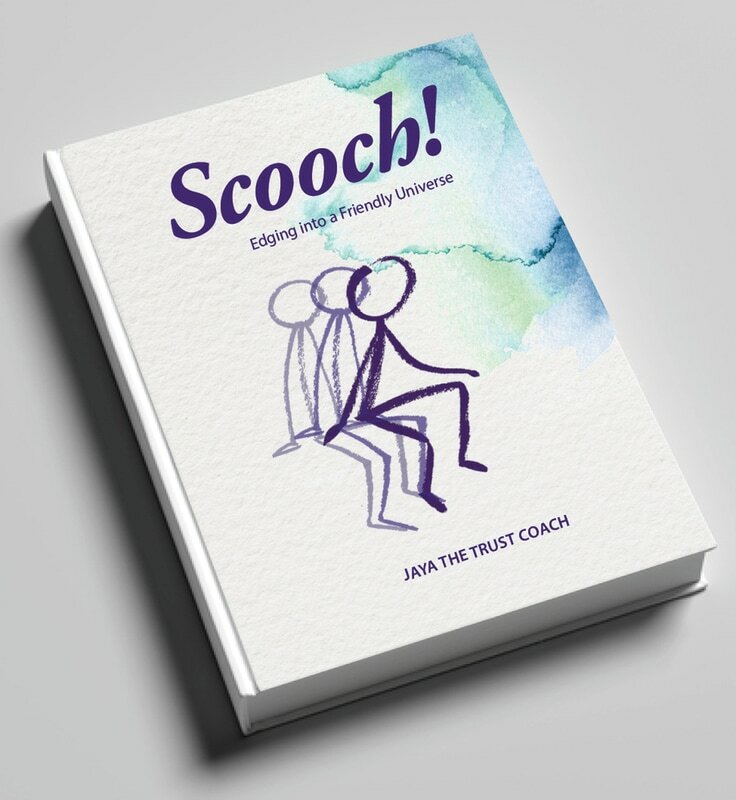 Look Inside Scooch! on Amazon. You can also order the book or e-book there. Here's a prior piece of writing related to the American election results that elaborates on the concept (and importance!) of choosing your focus.